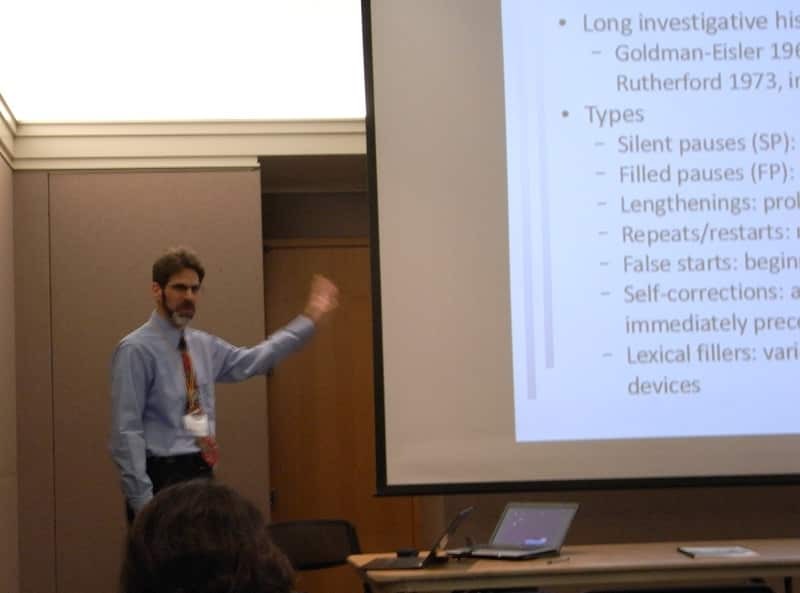 At the SLRF conference (see picture), I focused more on the model-theoretic implications of the results, emphasizing how the results suggest that some aspects of second language fluency are coordinated with first language speech characteristics and thus do not provide a reliable measure of second language fluency development. The slides for my JALT talk can be downloaded from here, while the slides for my SLRF talk can be downloaded from here. In addition to the many good presentations and plenary speakers I could hear at SLRF, one other productive aspect of the conference was the chance to meet Lorenzo Garcia-Amaya (web site) who gave an interesting talk on second language fluency and cognition, a topic that relates closely to my research interests. We had a good chat during the conference and have communicated by e-mail since about other topics like the cut-off time between normal silent pauses and long silent pauses which would count as hesitation phenomena. But I'll save that topic for a later post.